It's not my fault this time. I swear. Blame Frank. He did it. He GAVE me the rod. It's my third new fly rod in the past four months, but this time it's bamboo. The fly fishing seeds were planted years ago in my backpacking days when I liked nothing more than hiking along a beautiful mountain stream or camping within earshot of the soothing constant gurgle of running water. The desire was further cultivated by my stepsons who had hiked some of those waterways with me, recognized my love of that environment, and gave me my first rod and reel for Christmas; a gift I will be forever grateful for. It was my friend Frank, though, that brought the passion to full bloom. Frank was my executive director, back in our working days, and my friend and mentor, both professionally and piscatorially. He's fished around the world with many of the big names in our sport and he recognized the itch I had for the fine angling art. I recall him wiggling that first rod and, with a knowing look, saying "It looks and feels like a Sage blank". True or not, it was his way of giving me confidence and pride in my new gear, key to a beginner's psyche. He understands people in that way. He has mentored me, provided me my first trout flies (that he had tied) and first premium fly rod (for a tiny fraction of what it was worth), and has encouraged me to follow the passion in every possible way. Frank retired a few years before I, but we still have the occasional lunch together. Yesterday he put me in the position to have to explain yet another new rod. "How was lunch with Frank?" my wife asked as I came in the door. "I always enjoy lunch with him. ", I replied. "And today he brought me a surprise". "Really?!?! ", she said, with rising eyebrows. "Yes. It's wonderful. 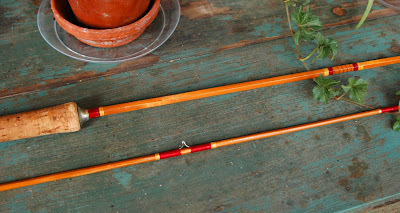 Look at this lovely old bamboo fly rod. He stumbled upon it at a yard sale and thought I would appreciate it." No further explanation was necessary. No playful give and take this time because Mary understands a friend's kindness and appreciates a graceful, elegant piece of workmanship from the past as much as I do. I'm a lucky guy in many, many ways. A terrific friend, a supportive wife and family, and my first piece of bamboo. Thanks Frank. Now let's get out there together and catch some fish with it.